Have some old or (newly made old by holiday gifts) electronics devices? 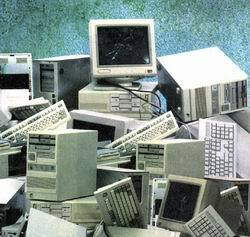 Well, here's another opportunity to get rid of them in an environmentally friendly way: Sustainable Flatbush's Post-Holiday E-Waste Recycling Event. It will take place on Saturday, January 5 and on Sunday, January 6 fromm 1PM to 5PM. The location wil be 462 Marlborough Road, which is between Ditmas and Dorchester in Flatbush. Among the devices being accepted are computers (laptop & desktop), monitors, printers, scanners, fax machines, copiers, networking devices, keyborards, hard drives, power supplies, TVs, VCRs, DVD player, cell phones and more. However, they can't take household appliances like microwaves and toasters. Media such as disks and tapes goes to www.greendisk.com, through which one can also directly send media for recycling. Materials will be recycled via the Lower East Side Ecology Center's partnership with BuildItGreen. Sustainable Flatbush is a sponsor of this event.